Last October, about 1.6 million juniors in more than 22,000 high schools took the 2015 PSAT test, which served as the initial screening for the National Merit Scholarship program. 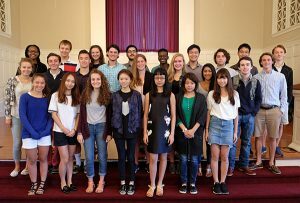 The nationwide pool of National Merit Semifinalists represents less than one percent of U.S. high school seniors and includes the highest scoring entrants in each state. At an all-school assembly on September 16, Director of Curriculum Kim Evelti presented Sarmad Mahmood ’17 a certificate declaring him a semifinalist in this very prestigious program. The following students were designated AP Scholars with Honor. This title is granted to students who receive an average score of at least 3.25 on all AP exams taken, and scores of 3 or higher on four or more of these exams. Congratulations to all the students who earned honors!